"I'm all for sticking it to the Empire, but what was in that convoy? You never told us why the mission was so important." There's been a rise of Rebel insurgency in recent months. Since the August release of the Tyrants of Lothal campaign expansion, Sabine Wren, Hera Syndulla, Kanan Jarrus, and all the other Spectres from Star Wars: Rebels have been taking Star Wars™: Imperial Assault by storm—battling Stormtroopers, exploding Imperial resupply depots, and getting away. Now, as Grand Admiral Thrawn sets his trap for these Rebels, they'll soon face their greatest Imperial Assault battles to date—the 2018 Star Wars: Imperial Assault Regional Championships! Will the Spectres and the Rebel Alliance strike yet another critical blow? Will Grand Admiral Thrawn successfully outmaneuver them and secure victory for the Empire? Or will the galaxy's Mercenaries prove to be the real winners—contracting themselves out to subdue their targets and collect their credits? 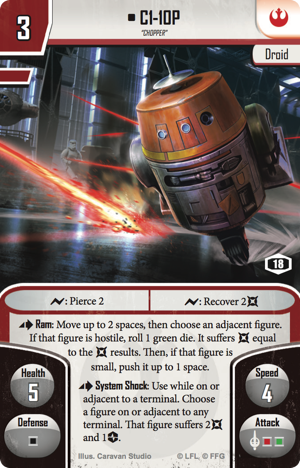 A capable and trustworthy astromech is an invaluable asset to any good Rebel team, so when you make the Top 64 at your 2018 Imperial Assault Regional Championship, you'll be happy to get an alternate art version of C1-10P "Chopper"—even if it means putting up with his infamously rough personality. While there are few teams as talented and successful as the Spectres, the Rebel Alliance's ultimate victory depends on the successful coordination of all its teams. Leadership is vital, and few leaders have proven as valuable to the Rebels of Imperial Assault as Gideon Argus. 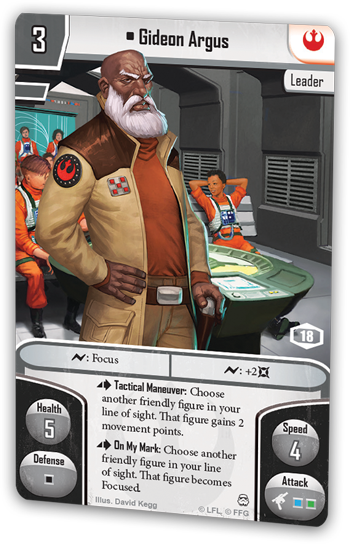 For their efforts, the Top 16 players at each 2018 Star Wars: Imperial Assault Regional Championship receive a plastic version of this esteemed Rebel leader. No matter how thorough the planning, every mission seems to go sideways at some point, and the only teams that prevail are those who can adapt and hold their own in battle. Make your way to the Top 8 of your 2018 Regional Championship, and when you're pressed to hold your own in battle, you'll be able to do so with this set of twelve custom dice. When you're always outnumbered, you want to be sure to make every one of your shots count for all it's worth, so if you make the Top 4 at a 2018 Regional Championship, you'll be glad to win and start applying this set of five acrylic bleed tokens when you battle your foes. 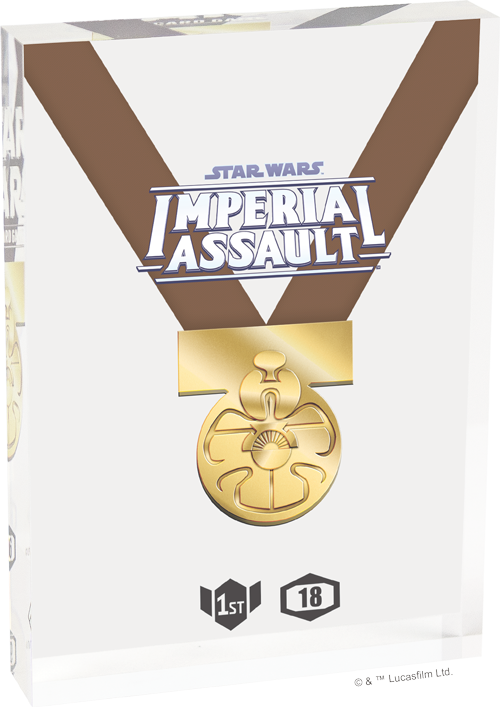 Successfully complete every mission at your 2018 Star Wars: Imperial Assault Regional Championship, and you just may find yourself honored as the Regional Champion! As Regional Champion, your heroism will be honored with a trophy inspired by the medallion ceremony that took place after the Battle of Yavin IV. Your troops will root for you as you look to carry on with the next mission—with a first-round prize bye at an upcoming Star Wars: Imperial Assault National Championship! With the recent release of the Tyrants of Lothal campaign expansion and accompanying Ally Packs and Villain Packs, we stand at the beginning of a new age for Star Wars: Imperial Assault. Will we find ourselves headed into an age of rebellion? Or will we see Grand Admiral Thrawn coordinate the Imperial military response with fantastic precision and efficiency, crushing the newest Rebels as soon as they reveal themselves? 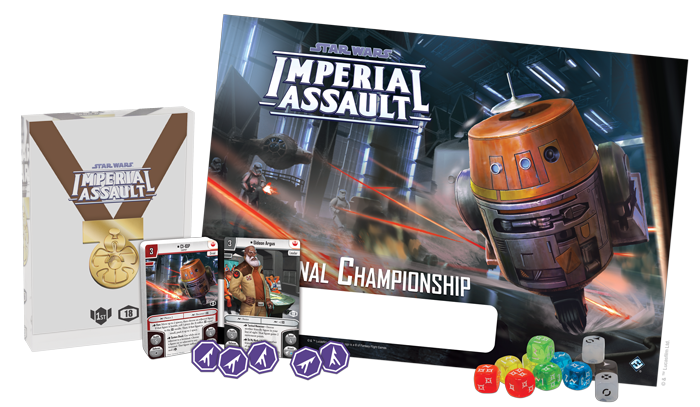 It's a thrilling time to take part in the high-stakes skirmish battles of Imperial Assault, so head over to our list of 2018 Star Wars: Imperial Assault Regional Championships to find one near you!